I’ve noticed a few new pubs around lately, thanks to some late saves by craft beer outfits – hooray for The Parcel Yard, the Holborn Whippet and the Pig and Butcher, but they’re few and far between and limited to central London. I didn’t realise just how many local pubs had vanished beneath the rapacious claws of property developers looking to create new investment portfolios until I saw a website called the Lost Pubs Project, which is photographing and listing all of the lost pubs in great Britain, here. What’s shocking about this vast swathe of wiped-out properties is that they go despite well-funded community attempts to save them. The ones listed on the site are only the most recent losses. The roll-call of lost names is all the more depressing because many public houses have extraordinary histories attached to them which involve local people and local legends. The loss of the Mother Red Cap in Camden was the end of a tale of witchcraft and magic that simply vanished after the pub was gutted and meaninglessly renamed ‘The World’s End’. Recently the Black Lion in Bayswater – a 300 year old pub first listed as an alehouse in 1704 – changed hands for an astounding £27 million. You will not be surprised to learn that the buyer is a new Jersey-registered developer called 123 Bayswater Road Ltd, who is expected to turn the building into more luxury flats. This is typical behaviour from the kind of developers who don’t care about unstitching the social fabric of London’s villages in order to turn a buck. In the area where I was born, Greenwich, over eighty public houses have shut lately, including the one I used to go to with my parents and grandparents. But I guess kids don’t do that sort of thing anymore. Many of the vanishing boozers listed in the Lost Pubs Project are beautiful inside and out, and are listed. No matter – the developers keep the features and charge even more. I’m reminded of Terence Davies’ marvellous trilogy ‘Distant Voices, Still Lives’, and ‘The Long Day Closes’, which features many Liverpool pub get-togethers, but the whole history of British film seems to be allied to the history of the pub. The move to home drinking is economically driven – as the wealth gap continues to widen, many pubs which were built for working class families have faced a stark choice – up-sell or sell up. Once a longstanding license has been taken away it is all but impossible to get back. Certainly, the days when there was a pub on ever corner have passed, but they do still preserve a communal way of life across the UK that is now somewhat lacking in our homes, and it would be a pity to lose them forever. Sometimes you can understand it. When we visited the Old Monkland area outside Glasgow we found a big brick pub and inn next to the remains of the canal. When it flourished it would have had the miners from at least two pits as well as the canal men. There is no mining there and the canal is long gone. The locals have what looks like a rather dismal or at least unwelcoming spot a few hundred metres away. The brick building was for sale and I stood there and speculated on the possibilities, not allowing for difficulties in obtaining a liquor license, of course. Hope your day improved, Jo. This is truly depressing. Another downside is that those pubs that are left become most dreadfully overcrowded at times: Friday evenings for example, and this is likely to put off those who would like a quiet corner to relax in. Obviously we do not want to resurrect one reason for pubs’ previous ubiquity: that families were living in one room, and the pub really did act as a living space for people in the evening, but the numbers being closed seem horrifying. 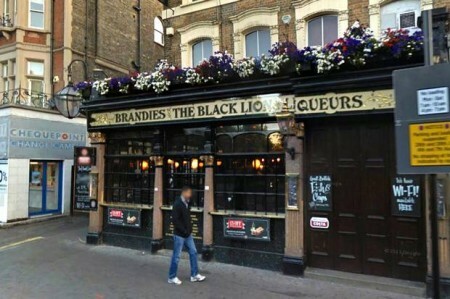 Are there still 80 pubs left in Greenwich, for example? There seemed to be quite a few pubs in Greenwich when we were there last month, although we were mostly in the tourist area, of course. I don’t know whether the Bell’s is a little better or I’ve just learned how to talk and eat around it, Jo. I get pain in the eye, which is a little off-putting. We stayed on Leinster Terrace (Walk? Street? whatever) in London and the Underground Secrets of London program we just saw says that there are fake buildings in that Georgian frontage that cover where the underground was dug. Is that really so? If it is I wish I’d known so I could try to figure out which ones it is. Hi,Helen. Numbers 22 and 23 Leinster Gardens are the pretend houses. Just ‘stage flats’, to protect genteel Victorians from the sight and sound of the underground trains,which emerged into the open to let off steam and other gases from the steam engines. Hope that’s helpful. Right, so now I’ll have to check my pictures and see if they are in them. It’s a very genteel street so you feel a little odd with a bag of dirty clothes headed to the laundry around the corner.